Audrey grew up in Unity, Pennsylvania (a small town about 40 minutes from the North Hills of Pittsburgh). Margaret Theresa (Sister Audrey) was the 5th child of 8 children…4 boys and 4 girls. In the 1930 Federal Census, the family and their ages were listed: Paul Michal Drap, 43, Annie, 42, John, 18, Paul, 16, Anthony, 7, Cyril, 6; Margaret 4, Cecilia, 2, Mary 1, and Annie, who was born between 1930 and 1940 and is not listed in either census. The baby Annie, who was known as “Honey”, died when she was six years old. Sister Audrey still grieves the loss of the sweet angel, Honey. Although, Sister Audrey would have been very young when Annie died, those memories of her sister are very present today. According to the 1930 census, her father was a coal miner and was listed as born in Czechoslovakia emigrating in 1910. Sometime between 1930 and 1940 the family moved to a farm. Her father was working in a mine. Audrey says her father spoke “broken English, but enough to transact business, her mother only Slovak. The family worked on a farm raising corn, tomatoes, and peppers, and other vegetables. Her father and brothers always chose her to lead the horses when they were harvesting the hay. Margaret, later Sister Audrey, always drove the rake in straight lines after the hay was cut. She finished her job by driving the hay wagon to the barn without sliding off the road or losing the hay. Again she was called on to stack the hay neatly in the loft when the brothers and her father pitched the hay to her. Sometimes, Audrey would lead a blind horse attached to a pulley that would raise hay into the barn loft. Sister said the horse was very strong and could still work even though it was blind. In the summer, Sister Audrey and her brothers would load up the corn they had picked and would go door to door selling the corn. Audrey still carries that memory with pride and longing. 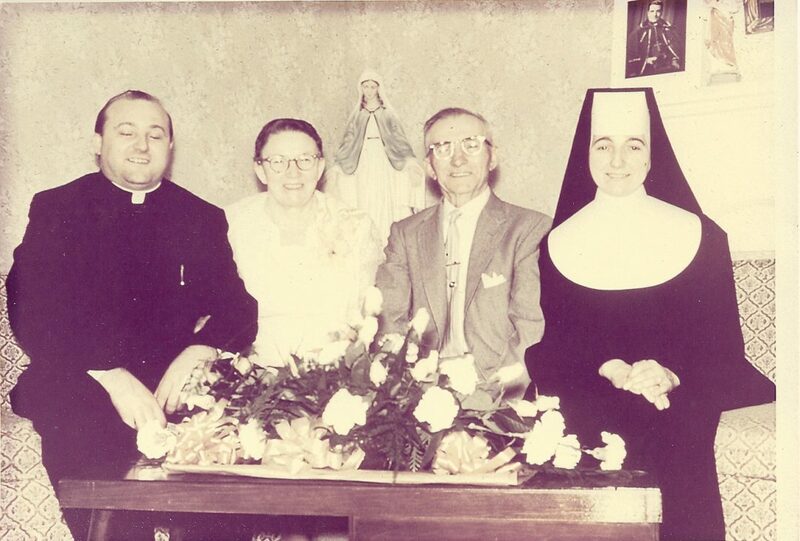 Sister Audrey with her mother (Annie), father (Paul), and her brother, Father Cyril. She attended Harding Public School in Plum Borough for eight years and Vincentian High School in Pittsburgh. Sister remembers “I was sick and tired of public school and wanted to attend a Catholic school and a school where they spoke Slovak.” She got some of her wish at least. 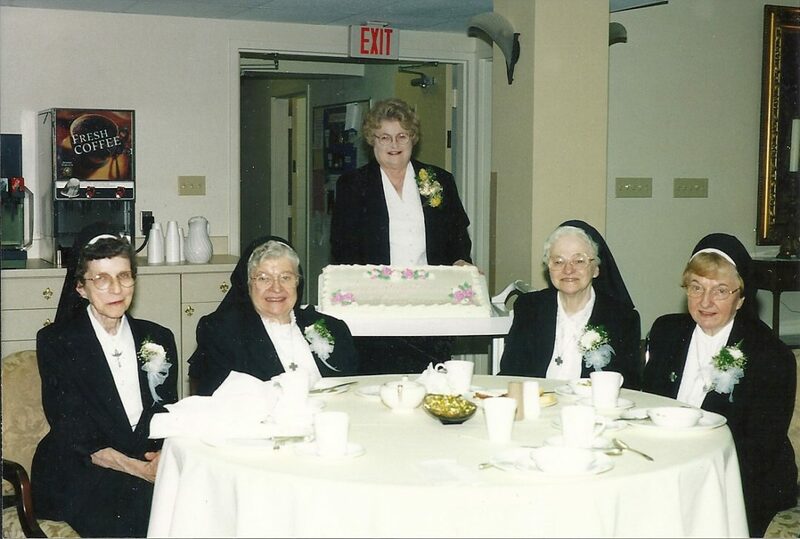 In her senior year she entered the Vincentian Sisters of Charity as a postulant. Continuing her education, Audrey received a B. Ed from Duquesne University and a Masters (MBA) from Notre Dame University in South Bend, Indiana. Her remembrance of the degree from Notre Dame is quite unusual. 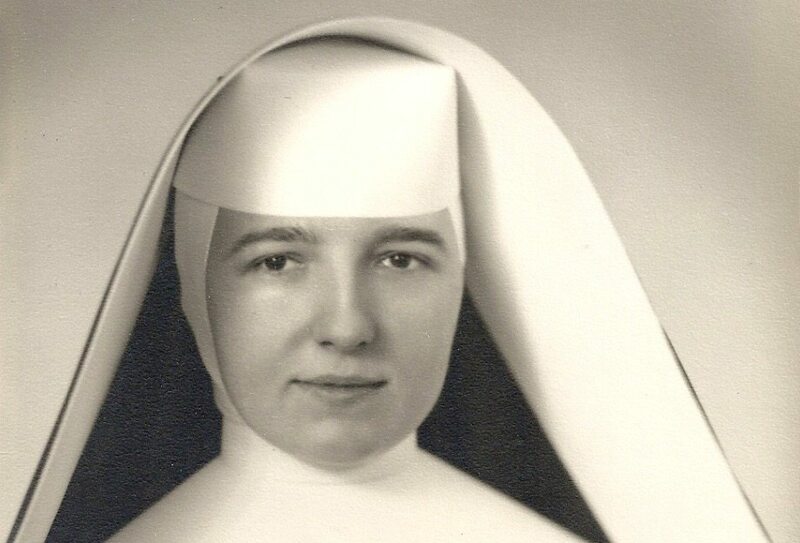 Sister related that she was asked to accompany Sister Marita Pozek as a companion to Notre Dame. She attended all the classes and without special intent earned her MBA, as well. 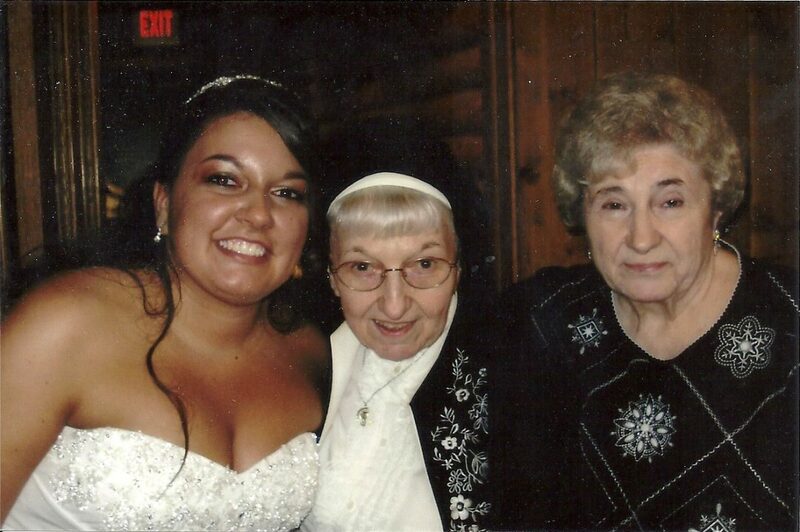 Sister Audrey with her sister Cecilia and niece Jessica on Jessica’s wedding day. (Sister had a special relationship with her brother, Father Cyril. Her pride in his accomplishments and his various assignments were many times part of our conversation.) Father Cyril was the confessor for the Mother house on McKnight Road. 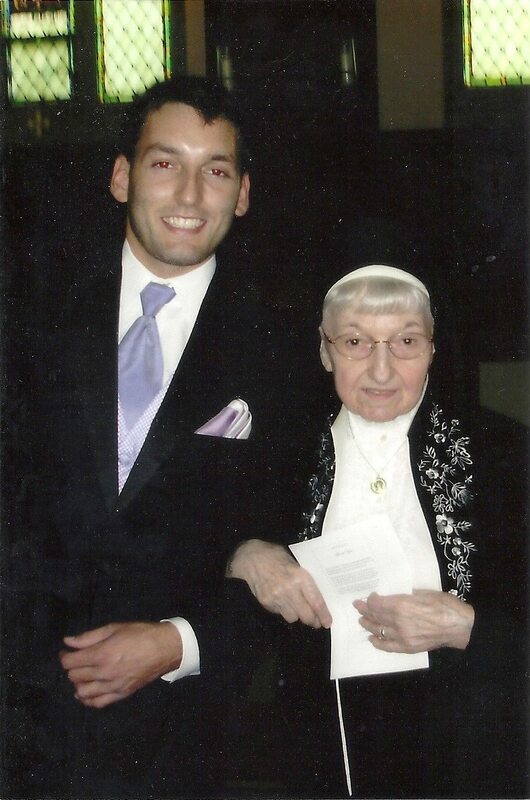 Sister Audrey says firmly, “I always made sure not to get in his confessional line.” Father Cyril‘s last mission was at St Angela Merici Parish in White Oak, PA. One night the fire alarm went off at the school and the rectory, although near, was on the other side of a berm. Father Cyril ran to see about the alarm and exerted himself too much. He suffered a heart attack and died several days later. The alarm was false; there was no fire. Sister Audrey with her nephew David. She shares, “I taught all levels of education beginning with the second grade through high school in the Pittsburgh, Greensburg, PA and Mobile, AL Dioceses. Sister taught business courses, shorthand and typing in a high school in Alabama. One of her students won first prize in typing for the state of Alabama. She is so proud of that. Her teaching profession afforded numerous opportunities to attend workshops and conventions. In the summer of 1974, I was elected Treasurer of the Community. I held this profession for eight years.” Sister Audrey recalled that the filing system she inherited was very difficult to navigate. She and her assistant decided to reorganize all of the Sisters files. Deciding to alphabetize them by last name, they laid all the files on the floor and proceeded to put them in alphabetical order. Thus filing and retrieving information became much easier. For a diversion at the end of a busy day, she enjoys a game of cards with the Sisters after the evening meal. I always enjoyed spending time with you, Audrey on my many visits to St. Louise when I was Vice Provincal. You have a beautiful smile and twinkle in your eyes always! As a young sister I remember hearing the sport ‘s programs on the radio coming from your office. Thanks so much for sharing your wonderful story. The people of St Angela Merici parish still speak about what a wonderful pastor your brother was. What a wonderful story. You are a treasure to all of us. God bless you as you continue your ministry. Love your story Sister Audrey. You are such an inspiration to so many people. By the way, Go Steelers!! I enjoyed your story S. Audrey. I’m so blessed to have you for my prayer partner. You have a special place in my heart. So enjoyed the story of your journey as I always enjoyed seeing in Pittsburgh. Great journalism, Mary Gene.